'Jane Eyre,'' the Charlotte Bronte novel, arrives on Channel 13 in four parts starting Wednesday evening at 8, offering a new look at a much-filmed heroine. Jane, hired as a governess at that mysterious house, Thornfield Hall, headed by the romantic and tyrannical Mr. Rochester, has inspired at least three pre-talkie films and two with sound: in 1934 (with Virginia Bruce and Colin Clive), and in 1944 (Joan Fontaine and Orson Welles). There was even a Broadway version in 1958 (Jan Brooks and Eric Portman) [Hmmm…] and a 1971 television movie (Susannah York and George C. Scott). 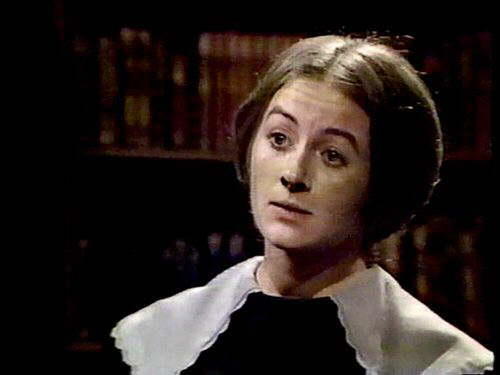 In this BBC version, starring Sorcha Cusack (daughter of the actor Cyril Cusack) and Michael Jayston, Jane will tell her own story – as she does in the first-person novel. According to Robin Chapman, the novelist and playwright who did the adaptation, ''usually when people dramatize 'Jane Eyre' they take away the narrative voice-over of Jane herself and this turns the book on its head. ''I think Charlotte Bronte was an early feminist,'' Mr. Chapman said last week speaking by phone from England. ''She debunks the Byronic glamour associated with Rochester.'' The first view we get of Rochester is a typically romantic, macho one, riding a horse – but he falls, Mr. Chapman noted. And by the time Jane is reunited with him at the end of the novel, ''he is reduced to a human being.'' He has been blinded but some of his sight is being restored. ''It's very much a parable,'' Mr. Chapman said. Please help me, I have drained my memory cells. I would like to know the name of a movie featuring George C. Scott. He was married to an insane woman and kept her locked in the attic. He was in love with another woman. His wife set the house on fire and, in the rescue attempt, he lost his sight. His character's name in the movie was Rothchild. I thought it was "Wuthering Heights," but after seeing it on TV recently, I found out it was not. My friends cannot recall the name, and some of them wonder if it is a movie. I told them I could never think of such a plot. I'd be a writer if I could. "Wuthering Heights" by Emily Bronte is a virtual sister volume to Charlotte Bronte's "Jane Eyre." The sibling Gothic novelists and their works are often confused. 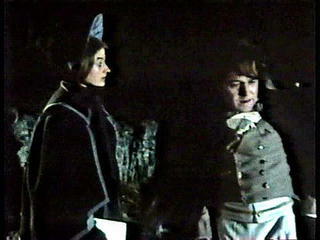 George C. Scott and Susannah York starred in the 1971 British TV-movie version, the third filming we can find. Virginia Bruce and Colin Clive starred in a 1934 rendering, and Orson Welles and Joan Fontaine played the leads in a famous 1944 feature showcasing a very young Elizabeth Taylor. By the way, Bronte's brooding hero is named Rochester, not Rothchild. Nobody promised Marla Schaffel it would be easy. It was 1995 when Schaffel, a dark-haired actress with an enticing soprano voice, performed the role of Jane Eyre at the first public reading of John Caird and Paul Gordon's musicalization of the Charlotte Bronte novel. Now it is 2000. More readings, several workshops and two pre-Broadway productions later, "Jane Eyre" will finally open at the Brooks AtkinsonTheatre in New York Dec. 3, and Schaffel will star in a part to which she has devoted much of her young career. "It's been very hard," says Schaffel, talking about the last half-decade during an interview at her Jersey City, N.J., apartment. Schaffel, two rambunctious Australian shepherds named Hotspur and Illyria, and one intimidated cat recently moved from Manhattan to a row house here. "Thehighs have been great, and the disappointments have been great. I'm not avery excitable person anyway, but we're on Broadway, and I think I should begoing Whooeee' – you know, dancing in the street. But it's just another day in a show that I love dearly. Because it has been five years." Musicals are notoriously difficult to birth, requiring skilled collaborationas well as large numbers of dollars. But "Jane Eyre" has had a harder labor than most. A 1995 workshop in Wichita, Kan., led Canada-based producer and theater owner David Mirvish to take the show to Toronto in 1996, with an eyetoward Broadway. But mixed reviews returned the creative team to the drawingboard. By the time "Jane Eyre" had its second pre-Broadway stand in 1999, at LaJolla Playhouse in California, Caird's book and Gordon's score had gonethrough numerous changes, and American Scott Schwartz had joined EnglishmanCaird as co-director; James Barbour had replaced Anthony Crivello in the leading role of Edward Rochester, the moody, secretive owner of Thornfield Hall, where the orphaned Jane Eyre is hired as a governess; and Mirvish had departed. "After Toronto," Schaffel recalls, "there was a reading where I felt I nolonger had an active character to play. And I was very clear to them at the end of that reading that we were not going in the right direction. And partof that has been the struggle about whether and how the ensemble should bethe voice of Jane. But Jane just became an incredibly passive character. And that's not for me." Inaction is not Schaffel's approach to life, onstage or off. Raised in what she describes as the "cultural wasteland" of Miami, Schaffel nonetheless decided that she wanted to be in the arts. She just didn't know which art to choose. "I started studying piano at 6; I wanted to be a classical pianist," the32-year-old actress relates about her childhood exuberance. "I started studying ballet and I wanted to be a ballet dancer. I always sang, and Iwanted to be an opera singer." "When I was 10 or 11," she remembers, "I saw Teresa Stratas perform Mimi inLa Boheme' at the Metropolitan Opera. It rocked my world. She was the most spectacular actress I had laid eyes on. She was so vulnerable, and her physicality was so beautiful. When the sound came out of her, and she was hunched over, it just came from her bowels. She threw caution to the wind when she was performing. I decided I wanted to be that kind of actress." In 1990, Schaffel graduated from the acting program at New York City's Juilliard School. Four years later, with hard-won credits on her resume, including a stint as Fantine in the endlessly running "Les Miserables," sheauditioned for Caird, who had directed "Les Miz." 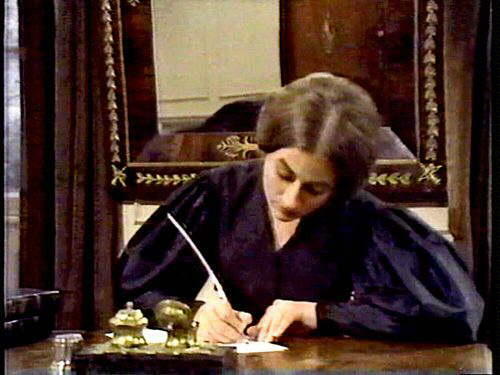 He was looking for a singer-actress to play Jane Eyre for a reading at Manhattan Theatre Club. "I remember wearing my hair up for that audition," says Schaffel, "and trying to be as small as I possibly could. Jane Eyre is supposed to be very short. Bronte herself was not even 5 feet. And she is supposed to be plain.I wore flats and a dress and no makeup whatsoever." "I sang my normal songs," Schaffel recalls, "which is one really high soprano number and one big belt number, and then John asked for a monologue- I had been asked to prepare a Shakespeare monologue. It was some compilation of Portia's lines from The Merchant of Venice,' and I went up on my lines in the middle of it. And John totally fed me the lines, to help getme on track. I was stunned. And I was mortified." Schaffel was the only actress Caird called back for the role. "I saw all the qualities of Jane in Marla," the director said during arecent telephone conversation. "Spiritual and emotional intensity and intelligence. The actress playing Jane has to be able to think and convey to an audience that she is thinking. Marla has the clarity and analytical powers essential for playing a Bronte heroine." Because of Schaffel's commitment to "Jane Eyre," at times it feels as though her career is on hold while she waits for productions of "Eyre" to materialize. Even after La Jolla, months passed before the producers found a suitable, and available, Broadway house, and last summer Schaffel used the time to star in "Enter the Guardsman," an off-Broadway musical. Finding her way into the role after a hiatus also brings challenges. "Jane's openness and vulnerability are the hardest things to get back to," says Schaffel. "I'm not generally a very vulnerable person, and it's hard for me to open myself every time we start the show again. Also, I've changed so much in five years, and my life has changed drastically – I was married around the time I got the show and now I'm no longer with my husband – that I have to remind myself to remember the unjaded, youthful side of Jane. Each time it becomes a process of tearing down my walls." It has continued to be difficult," says Schaffel, "but it has continued to be great." Marla Schaffel woreflats, a dress, no makeup and her hair up to audition for the part of Jane Eyre, a role she not only won, but also has been working on for five years in changing versions of the musical, "Jane Eyre." The show based on the Charlotte Bronte novel of the same name is finally set to open on Broadway Dec. 3. James Barbour stars as Edward Rochester. 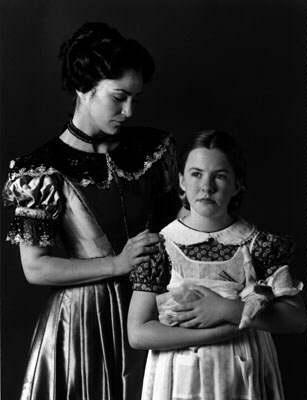 (above right: Mary Stout as Mrs.Fairfax, and Marla Schaffel as Jane Eyre at the Royal Alexandra Theatre in Toronto. Blogger is not allowing me to post the other pictures at the moment, so check back in the morning to see how Jane changed from Toronto to Broadway). ETA: (above left. Marla Schaffel as Jane Eyre with young Jane played by. Publicity photo for the La Jolla production. Bottom Right. Marla Schaffel as Jane Eyre from the Broadway production).